The holiday season brings images of presents, Santa, beautiful decorations, parties and festivities. Yet it is also the season for colds, viral and bacterial infections, and the “flu”. Often the first option is taking over-the-counter medicine for symptom relief. While we are aware of the typical holiday hazards for our pets and have taken extra precaution to keep our pets safe, often we not aware of the hazards for our pets due to OTC and prescription drugs. 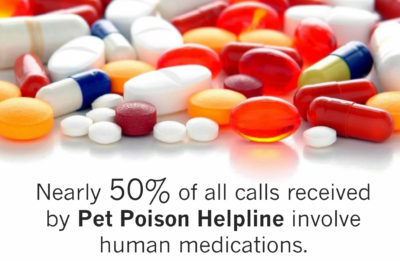 The Pet Poison Helpline states that “Nearly 50% of all calls received by Pet Poison Helpline involve human medications – both over-the-counter and prescription”. NSAIDs (non-steroidal anti-inflammatory bills) A few common ones are ibuprofen (Advil, Motrin) and naproxen (Aleve). This group tops the list and can cause serious stomach and intestinal ulcers and possible kidney failure in cats, dogs, birds and other small mammals. Acetaminophen (Tylenol) is a popular pain medication and though it is safe for humans, even children, it is very harmful to pets. Antidepressants such as Efexor, Cymbalta, Prozac, Lexapro. Benzodiazepines and sleep aids such as Xanax, Klonopin, Ambien, and Lunesta. Cholesterol medicines such as Lipitor, Zocor, or Crestor. Many “cold and flu” products are a combination of NSAIDs and decongestants. It is important to check labels for the ingredient listing. It is also important to keep the package so you have the ingredient list available in case of an emergency. If you carry cough drops, gum, or medicines in your purse make sure it is out of your pet’s reach. Holiday entertaining and additional guests in your home increase the likelihood that your pet could snoop in a purse and find harmful pills. Ask your guests to “guard” their purses and explain the reason why. Never leave your pills anywhere a pet can reach them. 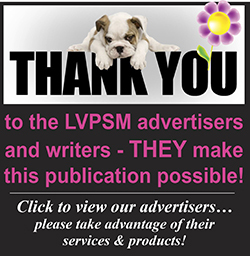 Some dogs can chew through a pill bottle or a 7-day pill box to get to the “treat”. Call your veterinarian immediately if you suspect that your pet ingested any medicine that wasn’t prescribed to them.